Okay, I'm SO EXCITED to be hosting this giveaway. 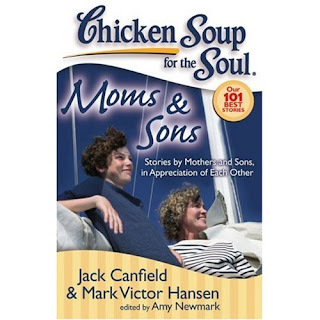 You guys know the Chicken Soup for the Soul books right? No? it's basically a collection of short stories ranging from heartfelt and insightful, to funny and life altering. Really great books. 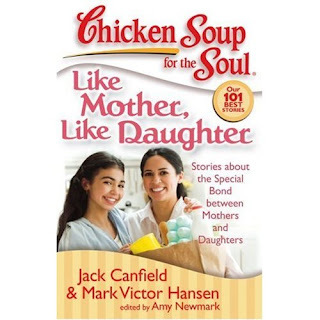 Well, they're coming out with a "moms" type series, and I have 3, count 'em THREE books for you to win. 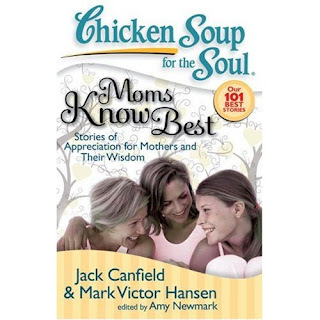 And, to wet your whistle, here's an excerpt from Chicken Soup for the Soul: Moms Know Best. and made a scene, demanding he pay for my unused dress and shoes. even more humiliating. Mom was always there to serve and protect. curfew, and their parents would never in a thousand years catch on. it home safely that night, and I spent the night at a friend’s house. the time I thought was pretty cool. the front door to greet me. “I’m gonna take a shower now,” I began. all out sooner or later. Should I tell her? for myself if I needed to. A lie (just this once) couldn’t hurt anyone. relieved. I was shocked. I was guilty. gotten away with it. I know that for a fact — or do I? Sooner or later she would have probably found out about everything. given a later curfew, not to mention more privileges. liked being able to share with her. anymore, I still confide in her and tell her everything. Well — almost. Contest closes Wednesday October 1, 2008 at midnight, est. I'll be picking a winner at random and will contact you if you've won.